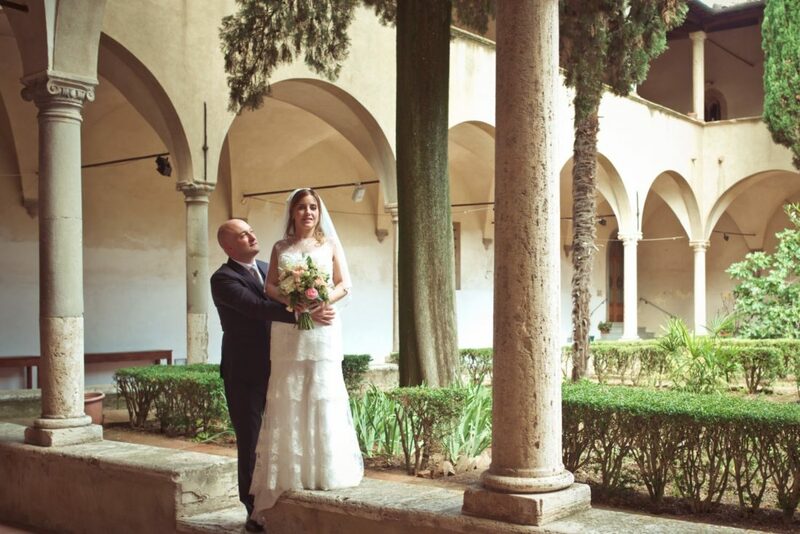 Couples come to Tuscany from all over the world to make their wedding vows in either a traditional Catholic Sacrament Wedding Mass or the Rite of Wedding without the Mass. Most of these couples are from Europe, especially Ireland, but nowadays many American couples are deciding to have their dream Catholic wedding ceremony in one of our beautiful locations. There are plenty of Catholic parishes in Italy, so if you are planning a Catholic wedding in Tuscany you will have the opportunity to choose your venue from our beautiful churches, small chapels and cathedrals which are scattered throughout the region. At BeA Alfresco we will help you with your choice of venue, whether you’re looking for a simple service in the countryside or a more elegant ceremony in one of our magnificent city cathedrals or churches. Besides, some of our wedding venues – such as the Modanella Castle – also house beautiful chapels, where you can have your Catholic ceremony. We will also be there to assist you with all of the necessary documentation required for a Catholic wedding in Italy, including a pre-nuptial inquiry which is required for foreigners who want to marry here. Finally, we will help you in choosing and writing your order of service, so that your guests will be able to follow the Holy Mass and to bring home a lovely souvenir. Your order of service will be coordinated with the wedding theme and color scheme, and it can also show the wedding logo or monogram, which our graphic artist can design for you. Your wedding ceremony will begin with a greeting from the priest and an opening prayer, followed by the readings by guests of the couple’s choosing, and prayers. Non-Catholic guests are not expected to kneel and stand but may simply sit and follow the ceremony. Subsequent to the readings the couple will recite their vows and exchange rings, after which they may choose to have their favorite prayers read aloud and be given the Nuptial Blessing. Catholic members of the congregation may then take communion, which is followed by the bride and groom signing the register, the worshipers reciting the Lord’s Prayer and the priest giving a final blessing. The couple is now husband and wife and free to celebrate with their guests at the wedding reception in their chosen stunning Tuscan location! Many brides ask me if they can wear a gown with bare shoulders during the Catholic ceremony. Nowadays it depends on the parish and on the church chosen. Usually, it is in good taste that if the bride wears a low-neck gown, she will combine it with a shawl or a long veil. Anyway, it’s always better if you can hold some surprises for later, right?